Anti-Semitism arrives in the news like a migraine: a premonition promising pain with a swift, thorough delivery on that promise. The flap over Congresswoman Ilhan Omar’s dashed-off-seeming tweets about a pro-Israel lobbying group has stretched on for days, each of which has lasted a century. Thus far Republicans have chided Democrats for allowing a supposed anti-Semite in their midst. Democrats have capitulated somewhat, as is their wont. 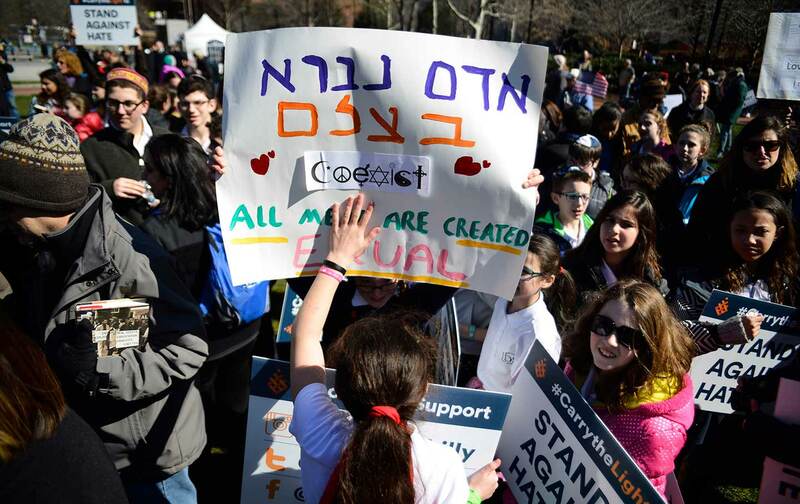 Leftist Jews have chided centrist and right-wing Jews, who chided them right back. Just about everyone has weighed in, from Chelsea Clinton to the president, who appeared unwanted but inevitably, like piss in city snow. And in the Twitter mire and growing pile of think pieces, in the swirling intersection of prejudices of this particular mini-scandal, clarity on what anti-Semitism is exactly and how to prevent it—becomes less and less clear with every word. The primary feeling I have when anti-Semitism comes up in the news is exhaustion. It’s almost preemptive; at the first mention of the word by a single pundit, all the strength leaves my bones. I want to drape myself on a divan and read the tender Jewish fiction of Joseph Roth for the next 20 years. Time and again, I’ve watched disputes over anti-Semitism whirl up and come to nothing, leaving only acrimony in their wake. The prospect of engaging with these discussions winds up being little more than daunting. This is not to downplay the importance of anti-Semitism. As a world-historical phenomenon, it’s remarkably durable. As a political tool, it retains the weight of a lead bludgeon. The way it’s surged back into prominence in recent years is impressive, and unavoidable if you’re a Jew online. The notion of eradicating it, like eradicating any hatred, is impossible to conceive. And it has recently led to a massacre in a synagogue, so the stakes are high and the wound freshly scabbed. But fighting anti-Semitism is like boxing a hydra. The scholar Deborah Lipstadt defines anti-Semitism as in essence a conspiracy theory. This makes it a very different sort of prejudice than mere disdain or closing one’s country club to Jews. Anti-Semitism is a worldview, more or less detailed depending on the dedication of the anti-Semite. Distilled to its essence, it’s a postulation of nefarious, transnational control by Jews of institutions, inspired by malevolence and cunning unique to us as a people. Some chapters of The International Jew have aged poorly; “The Jewish Element in Bootlegging Evil” or “Jewish Jazz Becomes Our National Music” seem unlikely to strike fear today. Other sections—“Does Jewish Power Control the World Press?” or “The High and Low of Jewish Money Power”—could have been tweeted yesterday. The notion of the Jew as puppet master (made quite literal in “Jew Wires Direct Tammany’s Gentile Puppets”) is at the core of anti-Semitism. It has little to do with politesse towards individual Jews and everything to do with who you believe controls the world. Anti-Semitism must be a comforting theory. It’s been called “the socialism of fools”—a reductive theory that rages about economic equality by placing blame for all disparities at the feet of the Jew. Thus vitriol is neatly directed at a set of individuals, while the system continues to function as it always has. And perhaps it is soothing to think that the world, instead of a lewd and ghastly welter of chaos, is actually being driven according to a distinct plan, even if it is a villainous one. Believing that the defeat of Jews would mean the defeat of evil is an optimistic thought: It means you believe that evil can vanish from the world. Regardless of its soothing properties, however, anti-Semitism also retains another classic feature of conspiracy theory: It is immune to fact, logic, and reason. And in an age in which new conspiracies take root so readily—in which anti-vaccination conspiracies have led to measles-ridden towns, in which an anonymous poster on 8chan can rally thousands behind the cryptic claims of QAnon—what chance does the oldest conspiracy theory of all have of vanishing? Anti-Semitism is a central tenet of the white-supremacist worldview: In the eyes of racists, organized efforts to attain racial parity cannot be created by those deemed intellectually inferior by virtue of their race. And so the cunning Jew is inserted as a catalyst. Prior generations of white nationalists believed that the NAACP was funded completely by Jewish communists. Robert Bowers, the shooter at the Tree of Life Synagogue in Pittsburgh, had a similar motivation—believing that Jews were responsible for promoting racial mixing—but it was modernized, slightly, by the idea that Jews are the éminence grise that drives immigration into the United States. (Bowers was obsessed with HIAS, formerly the Hebrew Immigrant Aid Society, a Jewish refugee-aid group.) The members of the Republican Party that so smugly mouth pieties about anti-Semitism today were perfectly happy to play along with a midterm strategy that posited George Soros, a Jew, as the creator and financier of migrant caravans north. Amid seductive whispers of conspiracy, any attempt to address grotesque insinuations can contribute to the idea of the world-controlling Jew, at it again, trying to silence critics. The notion that you can’t talk about Jewish money and no one is allowed to discuss Jewish influence lends strength to the belief that it is the Jew who is the arbiter of public conversation and its controller. Needless to say, these ugly whispers are given strength when accusations of anti-Semitism are used as crude weapons against political opponents; this is particularly egregious in the case of House minority leader Kevin McCarthy, Soros meme sharer, chastening Ilhan Omar with beatific hypocrisy. It is difficult to take something seriously as an idea while using it exclusively as a stick to beat the opposition. Discussing anti-Semitism can be maddening, at times even counterproductive; trying to box a hydra can drain the limbs of strength. And yet this oldest of conspiracy theories has led to millions of deaths, 11 this year; to terror plots; to assassinations; to threats; and to desecrations of our graves. It must be discussed, because allowing anti-Semitism to fester in darkness, poorly understood, and winkingly insinuated, is to allow it to flourish unchecked. And when it does, it poisons all it touches. Talia LavinTwitterTalia Lavin is a writer and researcher living in Brooklyn.